Why simply have dinner when you could witness a spectacle instead? 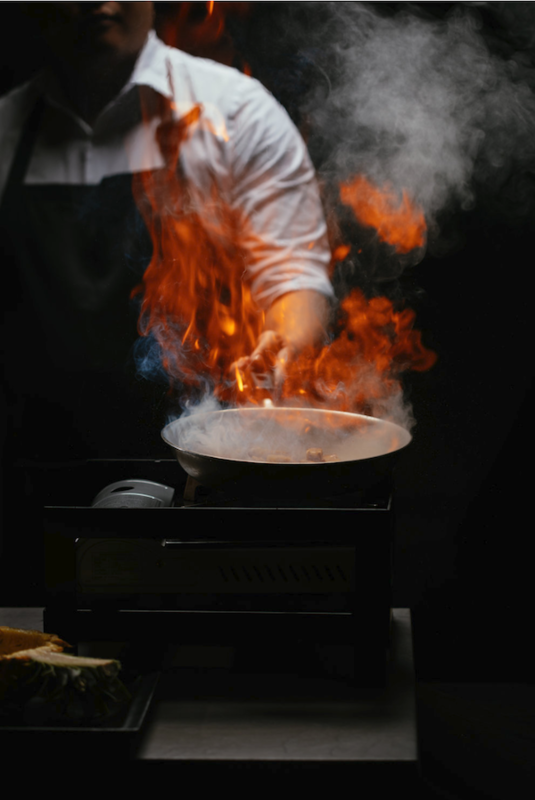 Chefs are staging elaborate sideshows to inject an element of drama into meals. 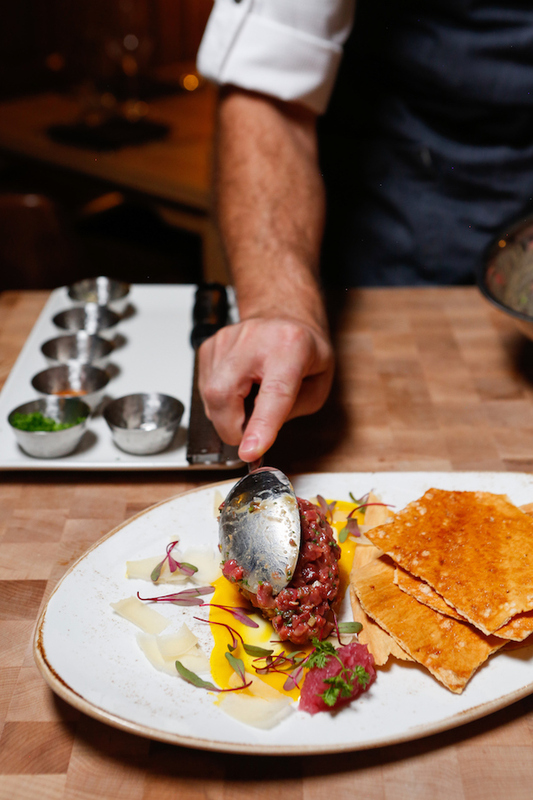 Here are 11 restaurants for tableside presentations that will steal the show. You’d better bring a friend if you want to finish this 28-day wet-aged porterhouse. That’s because it clocks in an impressive 40 ounces. As guests watch – and undoubtedly shoot video – the massive cut is flambéed. 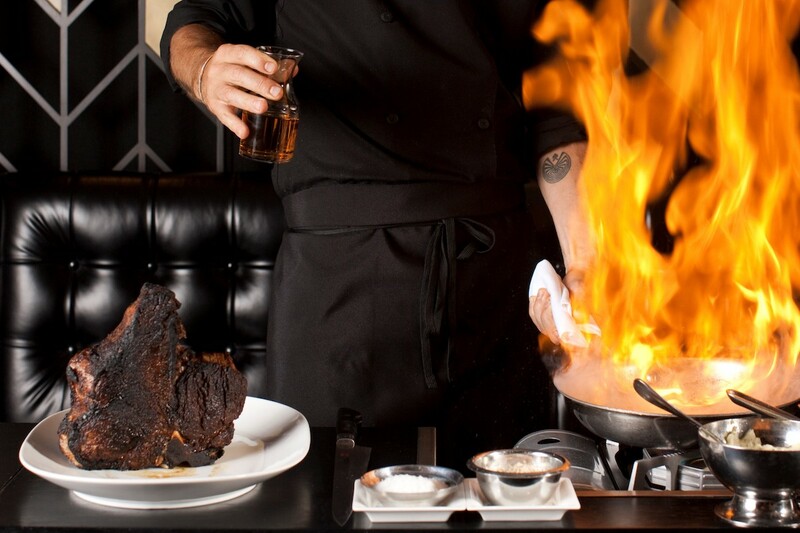 Make a reservation at American Cut Steakhouse-Midtown. You could call this Southern caviar service. Pimento cheese is amped up with the guest’s choice of dill, parsley, piquillo and jalapeño peppers, bacon, and Florida blue crab. The spread arrives with housemade crackers and seasonal crudité. Make a reservation at The Regional Kitchen & Public House. This bonbon cart is all our sweet dreams rolled into one. The candy store on wheels carries mini cassis and lime macarons, chocolate truffles, and lollipops. 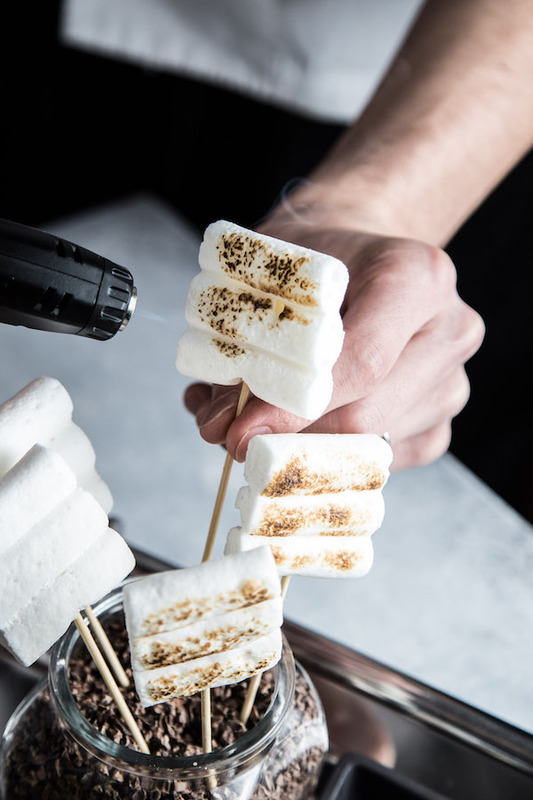 As if that wasn’t enough, marshmallows are toasted tableside. Make a reservation at Boulevard Kitchen & Oyster Bar. This is not your average fried rice. It all begins with a toban grilling plate. 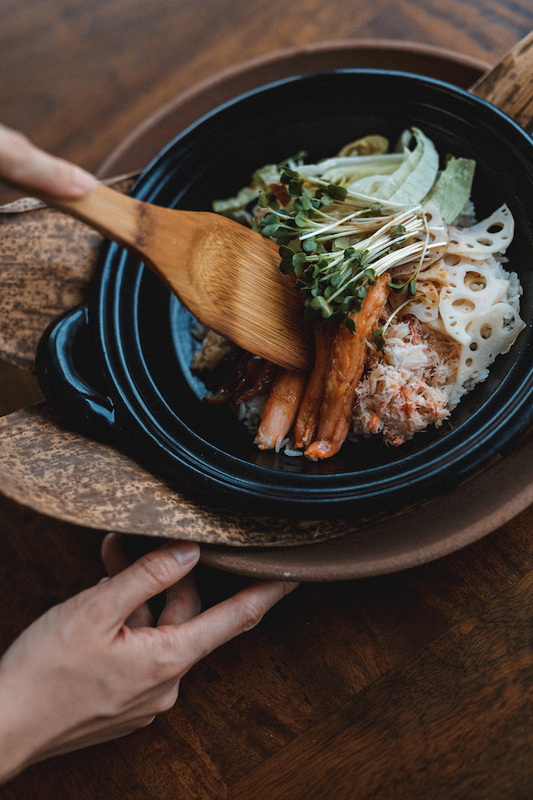 King crab, crab miso, lettuce, and rice are piled on its sizzling hot surface and cooked as you watch. Make a reservation at Azabu. River stones are heated to create a primeval stove. 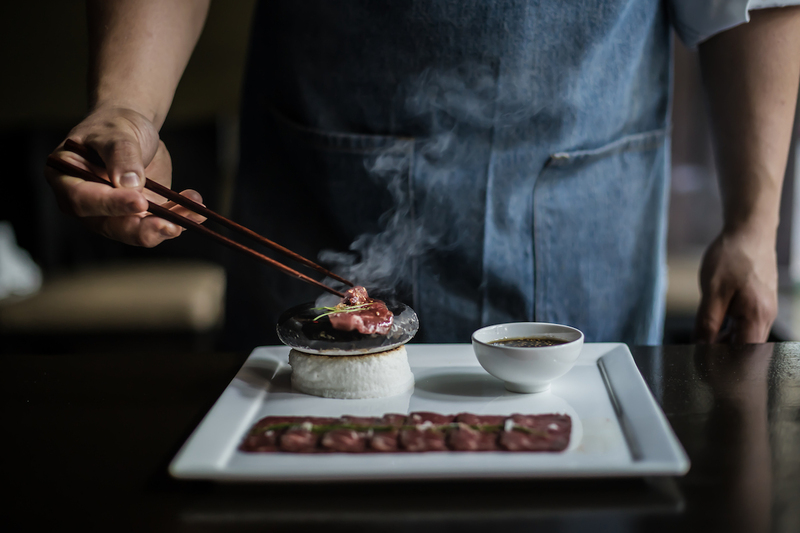 Guests dip razor-thin slices of kobe beef into sesame-soy dipping sauce and then lay them on the piping hot rocks. After a quick sear, they’re ready to eat. Make a reservation at Makoto. Servers at this steakhouse put on a heck of a show. The Spinning Bowl Salad – which features chopped lettuces, sliced beets, hard-boiled eggs, and croutons – is finished at the table. After giving the bowl a spin, the server pours in dressing from a gravy boat held above their head and then tosses together the components. Make a reservation at Lawry’s The Prime Rib. Diced beef heart and tenderloin are seasoned with black pepper, sea salt, raw organic egg yolk, chopped chives, and chopped chervil. Then chopped white anchovies, pickled mushrooms, grated parmesan, and extra virgin olive oil are added into the mix. A quenelle of tartare is placed on a confit egg yolk swoosh and garnished with grated cured and smoked egg yolk. Make a reservation at Urban Farmer. 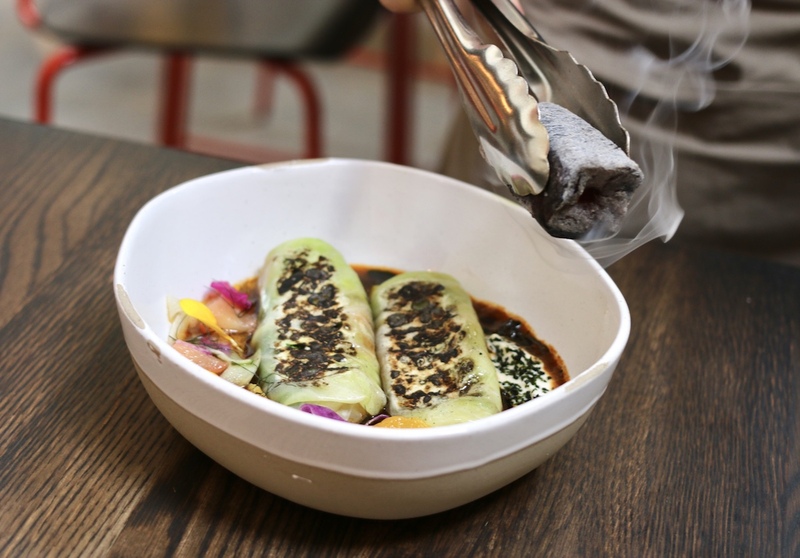 These cabbage rolls hold heirloom grains and preserved tomato and sit in a pool of beer cream and charred cabbage broth. Cooked on the hearth, they’re finished at the table when the server chars them with a hot ember. No, you can’t take the ember home with you as a souvenir. Make a reservation at the Brewer’s Table. A king salmon filet sits in a yew bento box, which is covered with a golden deluge of molten beeswax as the guest watches. 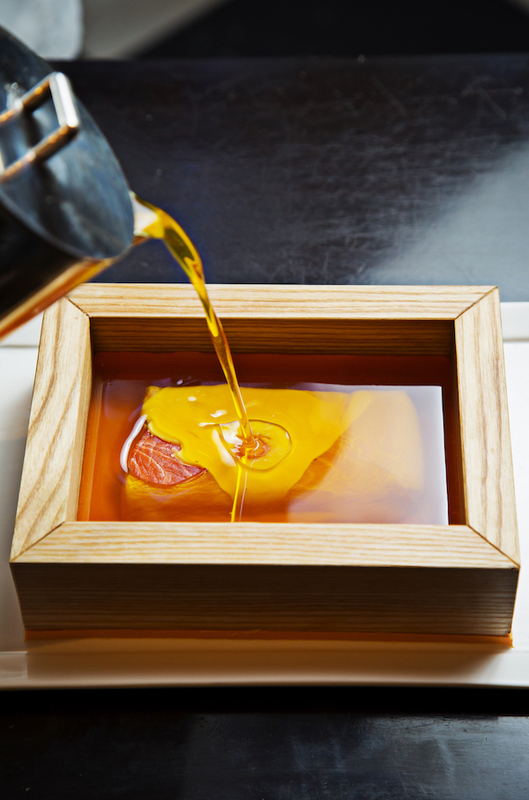 The wax crystalizes, infusing the fish with its delicate flavors. Back in the kitchen, it’s broken out of its mold and finished with a brown butter emulsion. Make a reservation at Plume. What the duck! 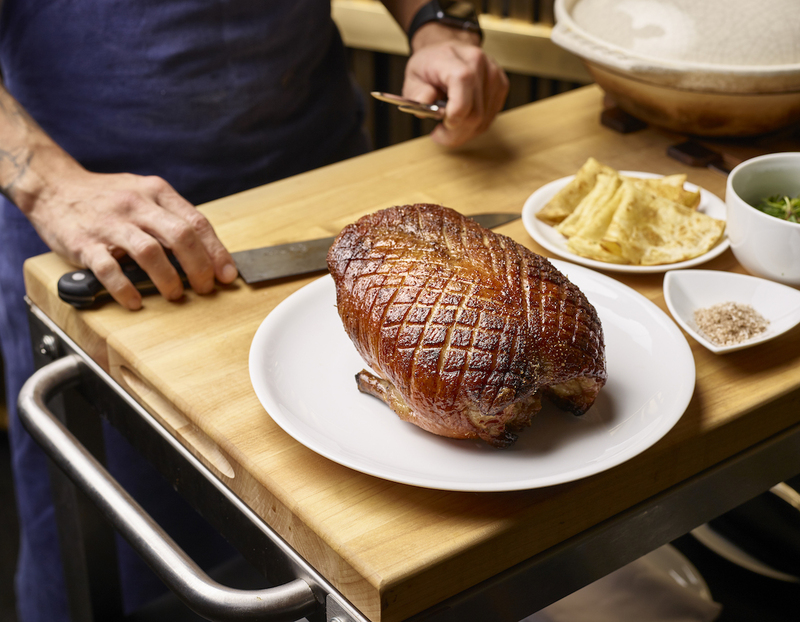 Aged in-house, the five-spice duck is carved at the table. It’s served with leg confit over rice with bibb lettuce, chive pancakes, kimchi, hoisin, ssäm sauce, ginger scallion sauce, and fresh herbs. Make a reservation at Momofuku. You may have had Bananas Foster before, but what about Pineapple Foster? Half a pineapple is carved up, sautéed in caramel, and flambéed with the help of some vanilla-infused rum. It’s served in its shell with vanilla ice cream. Make a reservation at Stripsteak by Michael Mina-Waikiki. 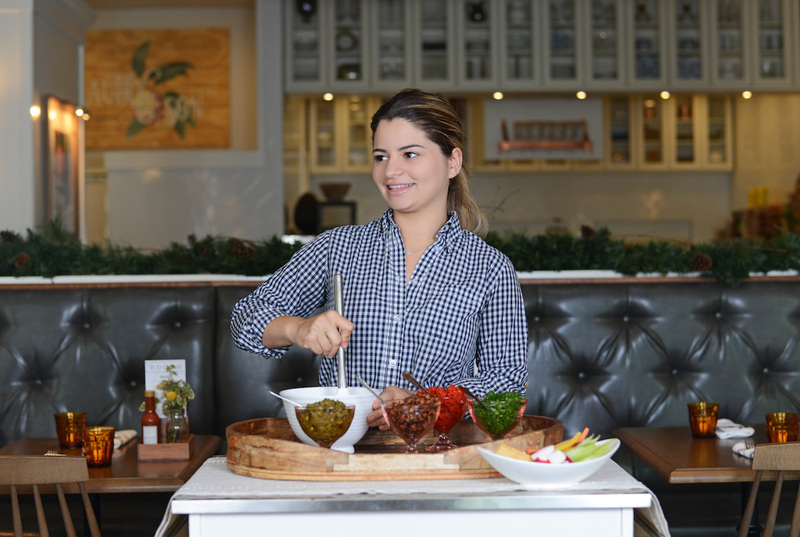 Have you been to any of these restaurants for tableside presentations? Let us know here in the comments or over on Facebook, G+, Instagram, Pinterest, or Twitter. And, remember to snap + share your #dishpics with us on Instagram for a chance to win in our weekly giveaway.